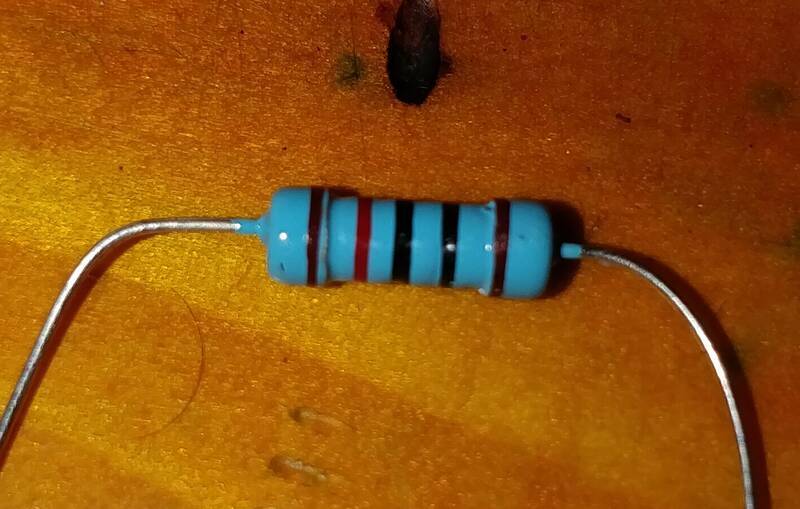 I have 500 resistors designed like this: That's brown, red, black, black, brown. Roughly equal spacing between all bands. 120 ohms, right? No. This is a 10k resistor: brown, black, black, red, brown. Why would they label it this way? They could easily have labeled it brown, yellow, SPACE, brown and it would be obvious how to read it. Am I missing some technique? According to the standard there is supposed to be a larger gap between the tolerance band and the others. Now, in your particular case, that difference is almost so subtle you can not see it. However if you look closely you can see that the tolerance band has a slight gap to the neck of the resistor comparted to the first digit. As such, this resistor needs to be read from the right. However, the tolerances involved in "painting" the lines is not that well controlled, especially for cheap resistors from over-seas. As such, sometimes you have no option but to verify the resistance with an ohm-meter. If the resistors are a mixed bag of singles, that can be quite the chore. If they are still on the tape, not so much. Measure one and write the value on the tape. If they are 5% or 10% resistors it's easier since silver and gold are not used in the first digit location. 4 band resistors are two digits, extra zeros, tolerance. 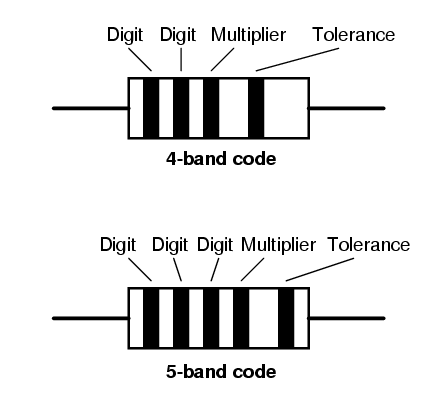 5 band resistors are 3 digits, extra zeros, tolerance. Mind you, it's a lot easier to work back from a known measured value and figure out what the bands mean, than to start from an unknown resistor, figure out left to right, or right to left, is that smudge an extra band, is that dark orange or light brown? With 4 bands, knowing the E24 series by heart counts for a lot, as there's only so many values it can be. 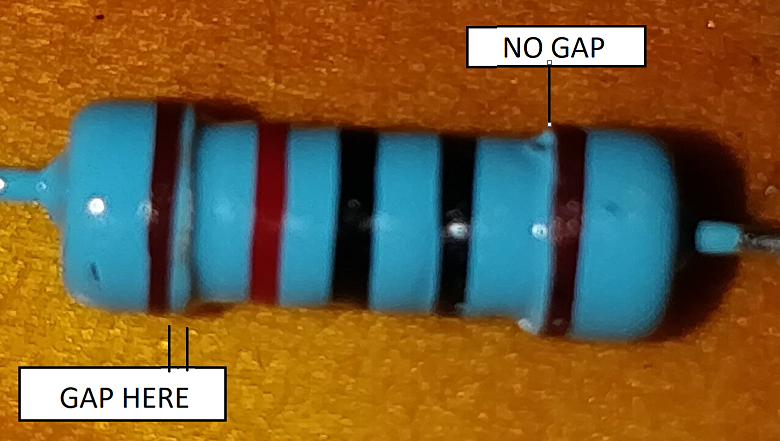 Five band resistors, at the one end, There is more gap at last band or Last band has less width. So you've to start counting from opposite end. 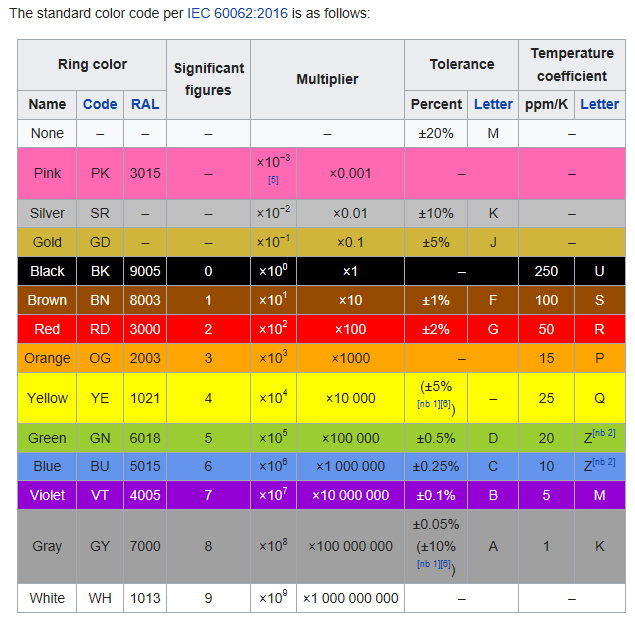 Why do resistors still use color coding? How (or if?) to isolate inputs to op amp summer? Unsolvable 5-Band contrary color band sequence!